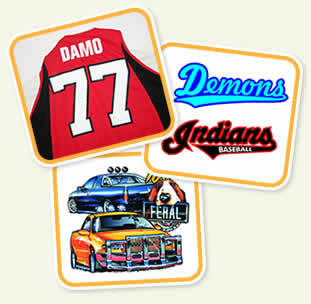 Sport Numbers Australia has been a leading manufacturer of heat applied products in Australia for the past decade. Supplying our products to manufacturers of sportswear, swimwear, schoolwear, promotional products and even fashion wear with their heat applied product needs. Our products (numbers, lettering and logos) have now, in the past and will continue in the future to adorn garments at all levels of sport. Including teams from the 2000 Sydney Olympics, NRL, Super 12, NBL, NSL leagues and AFL merchandise, to your local junior and senior competitions. Be sure to contact our experienced staff in either Brisbane or Sydney for all your clothes' marking needs. Our high standard of service is unmatched in the industry.